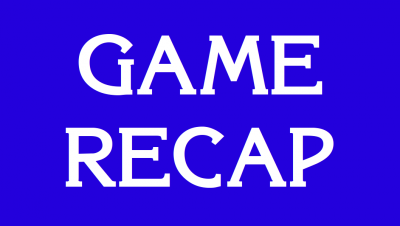 Today’s Game Show Network episode of Jeopardy! featured Ray from Virginia, Stacey from Texas, and 1-day champ Victoria from Georgia. Mr. Trebek mentioned that Victoria unseated David Madden, who had 19 wins. I am pretty sure this is the second-best run next to that of my hero, Ken Jennings. When I took the Jeopardy! test in Chicago in 2007, the Jeopardy! staff asked the test-takers that very question. Not only did someone identify Madden by name, but they knew how many games he had won! I was impressed…until the guy confessed he knew Madden personally. What are the odds? Anyway, Mr. Trebek could’ve said Victoria was a “giant-slayer,” but he didn’t. I love it when Alex says that, and I long to hear those words applied to me one day! On today’s episode, Ray started out slow, and in fact didn’t answer a clue correctly until after the first commercial break. Victoria, on the other hand, ran the first category, which featured the late Don LaFontaine reading clues about food. Victoria seemed to relish the clues, no pun intended. She even gave a couple of answers in a voice intended to be similar to Don LaFontaine’s. 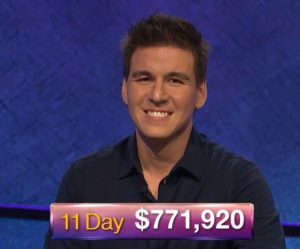 Ray was still in third place with $7200 (to Stacey’s $11,400 and Victoria’s $12,900) going into Final Jeopardy. He got Final Jeopardy right, though, and the other two did not. I was stumped myself. The category was “By the Numbers,” and the clue asked what this mnemonic helped people memorize: “How I Want a Drink, Alcoholic of Course.” (1) (The answer appears at the end of this entry.) Ray wagered $7000, thus making him the champion with $14,200. Finally, sometimes (okay, frequently), my job will interfere with posting timely recaps of Jeopardy! I want to know: On those days, would you rather have brief updates with fewer details, or would you rather wait up to several days for more thorough updates? I’ve posted a poll, and I would love to know what you prefer.